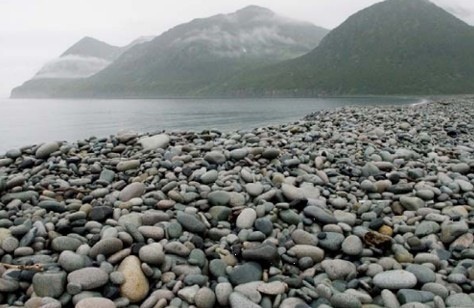 Listvenichaya Bay is headed by a broad cobblestone beach, the remnants of a glacial moraine with the rocks of many sorts scoured thereafter in the ocean. On the left is a stream leading up to a lake, which we had hoped to visit on the zodiacs, but unfortunately found the water level in the stream too low to allow the zodiacs to pass. The alternative was for a number of us led by Wayne to hike over to the lake, which was closer than expected. The walk over took us over cobblestones like those on the beach but in this case covered with colorful lichens. Others of us strolled along the beach, sometimes beachcombing, sometimes just admiring the beauty of the bay. Just in from the head of the stream were the huts of a pair of Russian fishermen there to do research on the salmon swimming up the stream. They and their dog greeted us warmly. The fishermen were cutting one salmon up for the next meal, presumably shared with their dog. They told us that they were waiting for a ship to pick them up, which was already delayed some four days. On the zodiac ride back Daria was asked about the reddish brown color of the cliff on the left. She said that it was from the ash from an eruption from one particular volcano, Ksudach, the color of the ash being the marker for a large eruption which sent ash widely over Kamchatka and which was quite useful for the geologists working in Kamchatka for dating the layers of rocks there. In the afternoon John gave a talk entitled "Russia's March to the Pacific." He noted that fur, highly desirable for winter clothing, was the first impetus for Cossacks to cross the Urals and go as far as Kamchatka, the Kurils, and even Alaska. The Russians clashed early on with the Manchu authorities in China's northern border regions, and the Treaty of Nerchinsk in 1689 was the first that China ever signed with an equal. The Russians got trading rights in China, but had to renounce their ambitions for control of the Amur River basin. It was later in the mid 1800's that the Russians were able to take the Amur area from a distracted China facing the Taiping rebellion and the second Opium War. The Russians then founded the warm water port city of Vladivostok. Eastern Siberia later was to have the same troubles as European Russia with a rising in 1905 after the losses of the Russo-Japanese War; the revolt of 1917 and the attendant brutal civil war and intervention by the troops of the Allies; and finally the purges by Stalin which sent so many to their death in the gulags of Kolyma. The Soviet Union had a policy of pressing the development of Siberia, and when the USSR collapsed, widespread economic distress and loss of population took place all over Siberia. Now, however, it is reviving with the oil output of Sakhalin Island and even tourism, such as by us. The Odyssey then moved south to Vestnik Bay, entering with some rugged islands on our starboard side with a well rusted and abandoned fishing boat on the rocks. We took the zodiacs out to look at the abundant water fowl in the water and in their nests high up on the cliffs. The number and variety of birds was impressive. Some of those we saw included tufted puffins, spectacled guillemots, and red necked phalaropes, Brent pointed out that the tiny phalaropes have a long distance migration from their nesting in the arctic, then flying deep down into the southern hemisphere. They also have an unusual foraging pattern, whereby they spin in the water, creating a vortex that brings plankton and other eatables to the surface, there to be gobbled.